I will readily admit that the thing that excites me most about today's launch of the World of Warships open beta is this World of Warships open beta trailer. That's not to say that the game itself won't be cool—I haven't played it, but I also haven't seen any "Wargaming, please sink World Of Warships" petitions on Change.org, so I assume things are going reasonably well—but any video that can make plodding, impersonal naval combat seem like the most exciting and action-packed thing you'll do this month is okay by me. Anyway, after a few "beta weekends" and a further closed beta period that began in March, Wargaming.net has flung the World of Warships doors open to the world. 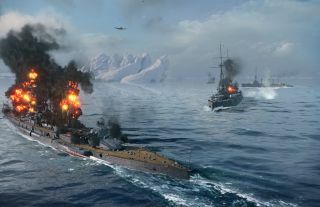 The open beta features more than 80 American and Japanese warships along with vessels from the newly-added UK and Soviet Union, and a "robust signal flag customization system" that will "display a player's prowess on the water while providing buffs and advantages." The World of Warships open beta is live now. Get the details and the client (it's free to play) at worldofwarships.com.